Thank goodness the new Wizard of Oz game for the DS doesn't closely follow the movie's plot, because this reporter, who played the game recently, could never get through that movie. The Wizard of Oz is a newly announced (today!) game for the DS coming this fall from publisher XSeed. It's a turn-based 3D role-playing game that was released in Japan by developer Media Vision and publisher D3 as the anagrammatically challenged RIZ-ZOAWD. It is based loosely on L. Frank Baum's book that was turned into a classic movie. Players explore a 3D overworld and participate in turn-based battles in a separate battle screen, as you'd expect a conventional DS Japanese RPG to work. No party attacks or summons in this one. All stylus control. Before playing XSeed's Half-Minute Hero and under secret embargo a couple of weeks ago, I took control of Dorothy at the start of the game, made sure she wasn't in Kansas anymore, followed the Yellow Brick Road (how am I doing with the film references), learned to pet Toto and fight enemies made of jelly before finally finding the Airy Scarecrow and adding him to my party. This was the most pleasant surprise of my week. The game was released in Japan several months ago, but the build I played, localized into English was still on a development cartridge. It will be released in the fall. Toto Involvement: I'm no Oz expert, as you can tell, so I'm unshackled from any desire for this video game adaptation to be true to L. Frank Baum's book or the famous movie. So, let Toto fight. 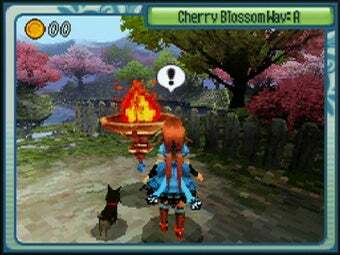 The poor dog is reduced to a follower, a poor-man's Fable II dog that can be petted with the tap of the lower screen. Trackball Movement: As potential Oz players can see from the screenshots, the lower screen is dominated by a simulated trackball. Flicking on it with the stylus works okay, but it feels like a control interface from the days of Super Mario 64 and, more specifically, Pac 'N Roll. I'd have loved for D-pad controls if only to be able to input sustained movement instead of having to keep that trackball rolling. The Visuals of Oz: DS screenshots seldom look good anywhere but on a DS screen. So if you're turned off by what you see in this post, don't disregard the game's looks. The game's 3D graphics are comparable to the best on the system. Stylized 3D may still enable a cleaner look (see Zeldas on DS), but for something more conventionally rendered, Wizard of Oz on the DS is top-flight. The Disregard For The Classics: Yes, you can get the Lion and the Tin Man in your party along with the Scarecrow. And you do meet Oz — or the guy playing him (should I have warned that a spoiler was coming?). But that Oz meeting happens within the first hour, after which the real goal of the game is to defeat four witches and fight lots of little creatures along the way. As this kind of long JRPG is not easily experienced in a five-minute demo, I didn't see or play much of the adventure. But what I did see mixed the familiar trappings that even a non-Oz-watcher like me have heard of with a colorful array of enemies and locales. People love the Wizard of Oz, and yet it remains one of the most popular pieces of adventure fiction to not have much of a presence in the gaming medium. There was a Super Nintendo Oz game. And maybe another one or two. But this DS game is a rarity. If you are into the fiction, it's worth a look. For those who need a gameplay hook, I can't say I saw anything distinct about how this game plays. Not yet. And now, as I end the piece, am I supposed to make a joke about not being in Kansas anymore or there being no place like home? Forget it.